It's here! The GBB from Maruzen that we expected is finally here! First off you notice as soon as you get it out of the box that the GBB is very solid. The shell is completely ABS, no metal body will be readily available in the near future - too much of the internals slide on the ABS and there are a few slotted attachment points and I am guessing that will drive the price of these items up. I will get to why I was already inside one of the good GBB's later. Performance - This gun is hot! In many ways, the detail is very authentic and the action works in the exactly same way as the real-steel. 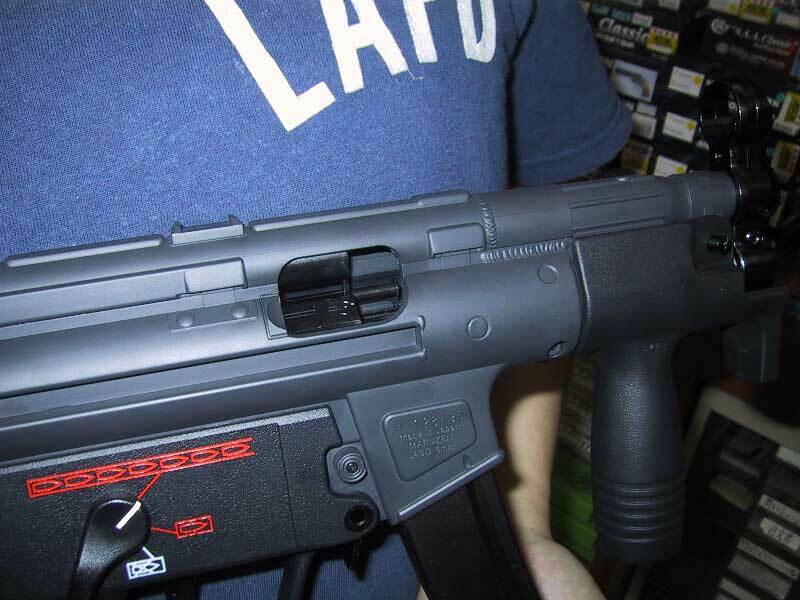 The charging handle moves the firing mechanism into the ready position, then when you fire the door opens and closes at a rate close to ~20 rounds a second. If the charging handle is locked back, it will not fire. It emptied the stock mag in under 1.5 seconds. In semi mode each shot gave a distinct snap. In full auto the GBB just twitches and blows bb's through both sides of a TNT box. Chrono speeds of 289fps with .25's, .20 netted speeds over 330fps. These are rough readings and more accurate reading will come later. The radar chrono I was using is kinda ummmm naff. Features: There is a hop-up, it is rated for .20 gram bb's as optimal rounds. The barrel is ~4 inches long. The mags are wider then Marui AEG mags. You will not be able to put them in double mag clamps. Reliability, this will be questionable. Popping the three retining pins will break the GBB into 2 pieces. Grip/Trigger and body. The grip falls away and the guts could be emptied out the back. This is a one piece mechanism and the design is so simple and fragile in a way. Well the first one I was using to chrono had a problem. First, when inserting the mag, it DOES not have a distinctive click and one sometimes wonders if the mag is completely in. I was slapping the bottom a lot and yes it was definately in. In semi-mode the snap would sometimes drop the mag out of the gun in a few shots. It left me wondering if I had put the mag in completely and repeated tests showed that semi-mode firing in a rapid sucession will shake the mag loose. It happened to me on a few occasions and it happened to Mirage once while playing with the GBB. 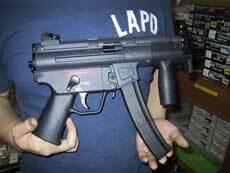 Problems: After approximately one hicap mag full of BB's the first GBB stopped chambering rounds. I noticed by looking in the mag well that the firing mechanism wasn't staying back (I used one that did work as a comparison). After quick disassembly, I was able to locate the spring that holds the firing mechanism back. It turned out that the spring slipped of a guide rod and thus jammed the firing mechanism. Reseting the spring fixed the problem for one shot, disassembly again deemed that the ends of the spring were to big. 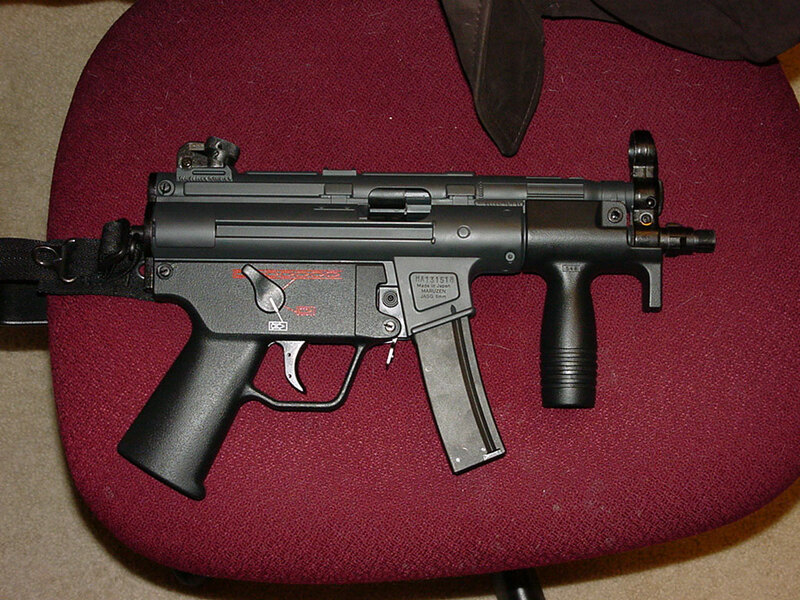 I took a pair of pliers and crimped the holes at the end down, reassembled the MP5K, problem fixed. Of the four that I got two of the other GBB's exhibited this problem. 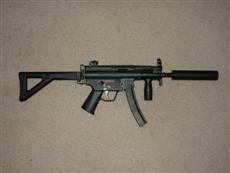 Overall it is a very nice GBB, powerful, realistic and not to spendy at $150.00 with HiCaps running at about $40.00. The action is simple and tolerances are not exactly tight, thus that may be why it is easy to misalign and "jam" in the action areas. 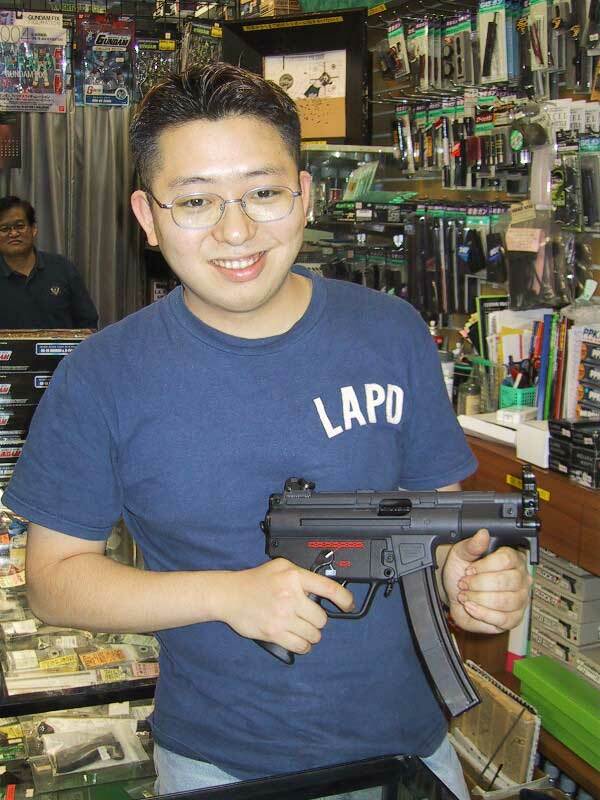 Not a good impression for me to be a primary backup weapon for airsoft, but then that first few could have been a fluke. The front grip comes off with light tapping after the retaing pin is popped off. Nothing is under there that I know of. I have replaced the Maruzen rear sight with a Marui MP5 rear sight, it fit perfectly. The Maruzen sight was a simple spin on sight that showed no difference between the four settings. I was also trying to take off the front sight end cap and replace that with a PDW front sight endcap. To date I have not been able to coax it off. 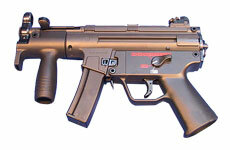 If I could swap it off the threaded Marui front could accomadate a Tracer Unit or a flash hider. 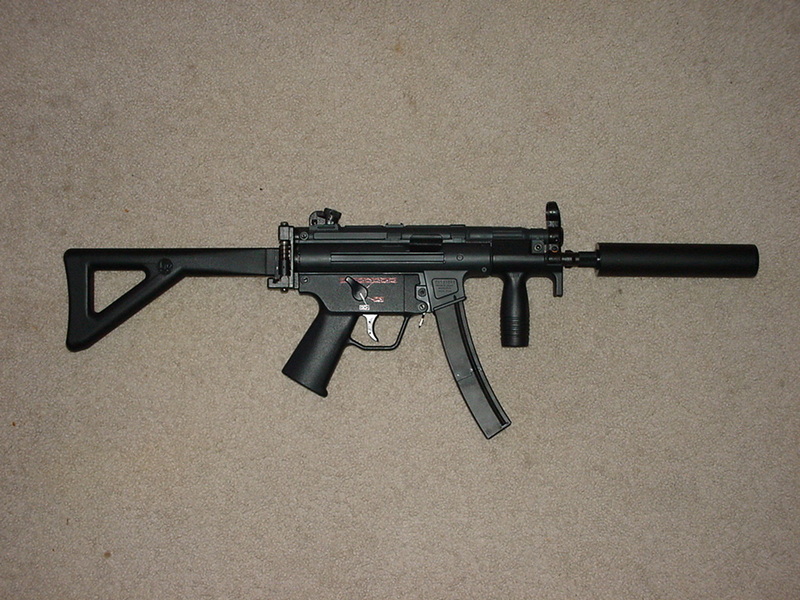 Also I took a folding stock from a Marui MP5K and put it up to the back. One could get it to fit with a little filing. 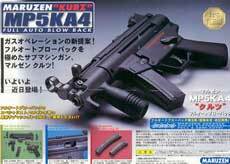 Accessories: You can already get a silencer for the Maruzen MP5A4 made by GuayGuay. RRP for this product as of 20/11/2001 is 65USD. Update 4/12/2001: As you know I have been monkeying with the Maruzen MP5K's. Well I was finally able to mate the Marui MP5K PDW front end to the maruzen and it was simple really (glad I did not force it to much). The front unscrews just like the Marui MP5K flash hider assembly. Then the front sight just slides off. Though the dimensions are simular the depth of the internal thread depths are different between the TM and Maruzen parts. TM thread depths for the front sight is about 3/4 of an inch, while the Maruzen thread depth on the front sight is about 3/8's of an inch. The reamaining depth is actually in the ABS plastic body. Maruzen was very smart in making their parts with the exact same thread depths as Marui's. Essentially TM parts will fit Maruzen's, but not the other way around. 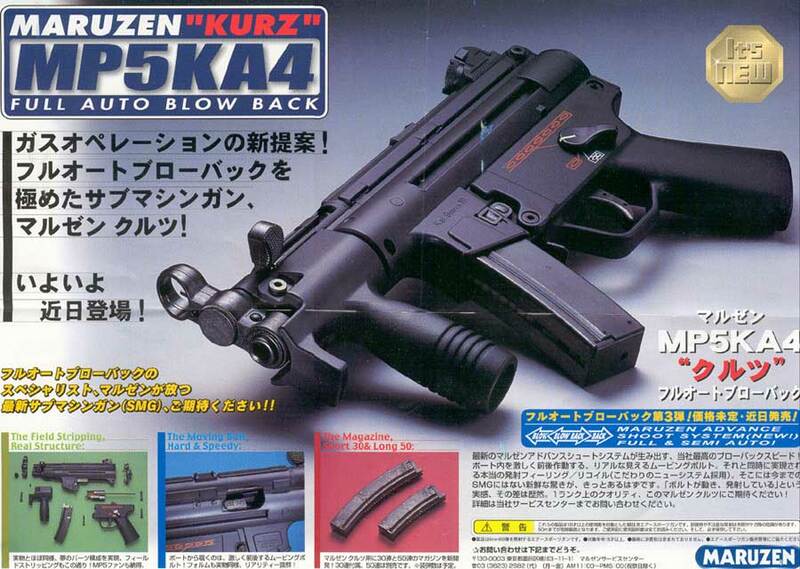 So leave the Maruzen front sight on. My next project is getting the stock on from a TM PDW. 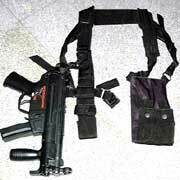 Another available accessory is the shoulder holster sling/rig. The images to the right are courtesy RedWolf airsoft, and depict exactly what you get from them. You can normally find these types of slings being used by most of the 'evil' henchmen in the major Hollywood films and blockbusters ('DieHard' and 'Lethal Weapon' come to mind). 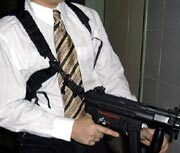 "Fully adjustable shoulder mounted sling strap for concealed carry of the MP5K or similar compact machine guns (works perfectly for the TMP as well!). Constructed in black nylon, this sling is fully size adjustable and comes with a quick release mechanism so you may release the MP5K from the sling for higher degree of movement. When not in use, a strap keeps the MP5K in place - smack against your body. 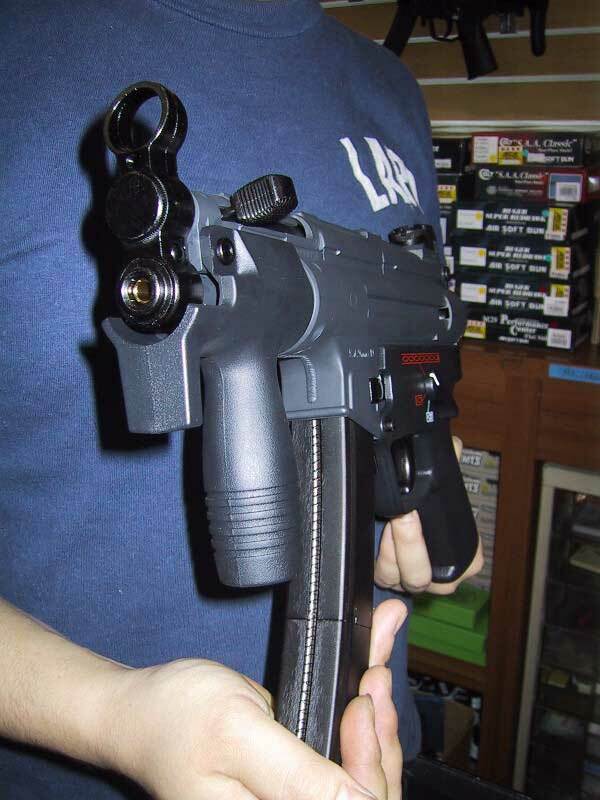 On the other side, two magazine pouches allow for quick reloads. Entire harness can be attached firmly to the wearer. Lower part of harness fastens to your belt to keep things nice and snug ..."
You can get the sling from RedWolf for $60, or (a better version) from EagleIndustries for about $80. 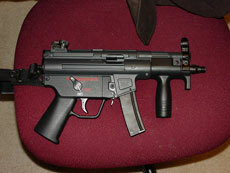 It's a Ferrari of Airsoft GBB's, when it runs watch out. When it jams you will be dissapointed. 5/5 - with the few niggling problems fixed it'll be the dog's danglies.